The MBTA Rider Oversight Committee released a report yesterday on the viability of using funds from a proposed student pass program with the region's innumerable universities to fund late night service. This follows months of research into other systems that have university transit pass programs in place and how those programs have succeeded phenomenally. The MBTA ROC's proposed program would follow in the footsteps of the Chicago Transit Authority's (CTA) U-Pass program, where area colleges are given the opportunity to purchase unlimited-use transit passes for no less than 100% of their full-time student body. In exchange for a 100% buy-in, the MBTA would offer semester passes to participating Boston-area colleges at a mark-down greater than the current college student discount. The program would be mutually beneficial since the students would be granted free access to all MBTA subways, light-rail vehicles, and buses, while the MBTA would receive additional revenue from the increased pass sales (the CTA, for example, generated $25 million in revenue through their U-pass program last year). Furthermore, the MBTA would be required to use that additional revenue to provide overnight service, which would be a benefit to all MBTA riders. The biggest and nearly insurmountable hurdle will be convincing these universities that paying into the program will be buying students real mobility. The Green Line and 57/A buses along the BU and BC corridors are hardly the paragon of transit reliability and speed. Additionally, there are many private carriers either run by the universities or contracted on their behalf that already provide a level of mobility across campus. These services could instead be given to the MBTA as an extension of the relationship with the T, but that is not explored in the report and would likely be a venture very far down the road. The $10 million would only go to operations of extended late night bus service since the T still needs to shut down rail service for maintenance, as has been covered by numerous press outlets, including the Metro and the impressive documentary that leads this post. Even more damning is the logistics in incorporating multiple technologies and standards into the same RFID card. Chicago's new Ventra system uses pre-paid debit cards integrated into MasterCard's PayPass system, which will eventually evolve into MasterPass and is already compatible with a number of RFID smartphones. HID, which provides the contactless card systems used by most colleges for integrated student ID key cards for residence halls, is also working toward integration with smartphones, which leads us even further toward the possibility that phones will be the common denominator for contactless payment and security systems. Phones are already a conveyance for currency in Africa and have been for years. For those without NFC/RFID-enabled phones, systems like Ventra still enable fare cards that work with the contactless system. Many transit agemcies are looking to replace their expensive and proprietary fare payment systems, including the MBTA. GM Scott has already voiced her interest in replacing the CharlieCard system and New York City has been working with numerous agencies to find consensus before they replace their nearly 20-year-old MetroCard system. CharlieCard, less than 10 years old, was delayed, well over budget, and outdated by the time it was fully implemented. The MBTA's reaction to the MIT hack of the CharlieCard itself was a significant setback and current policy and tightness around the system is preventing its growth, as acknowledged by many within the T. Standardisation of the payment system is the only way forward and that may well mean our phones are the lowest common denominator. This morning, the General Manager's twitter account pointed riders to an album of photos on Flickr covering the painting that happened at the Davis Square station this weekend. 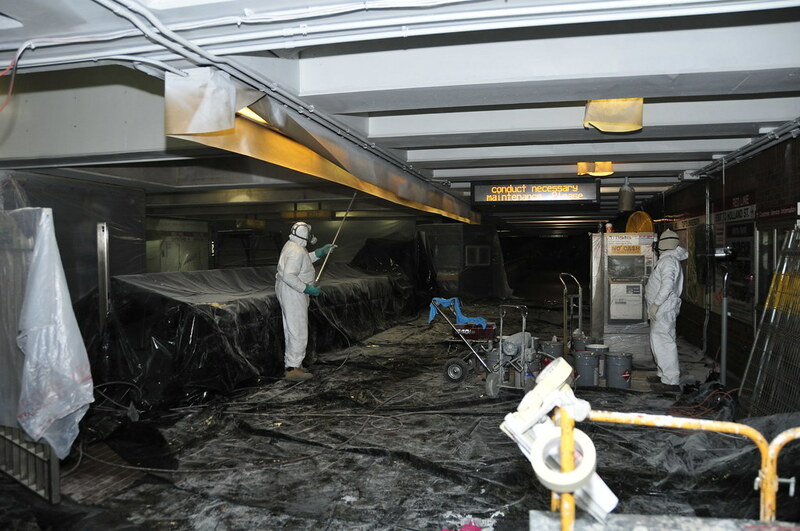 They also added a few photos of the continued work on the spot repairs they have been doing to the floating slabs along the Red Line, the primary project causing the ongoing weekend service outages of the Red Line north of Harvard. Before Rich Davey was General Manager of the MBTA three years ago, photos of work on the T were few and far between. Months after I started tweeting about the MBTA (prompted by the phenomenal 2009 derailment of the Red Line, which I experienced personally on a train) and in May 2010, shortly after Davey took office, the MBTA created their twitter account to directly address customers in real time. 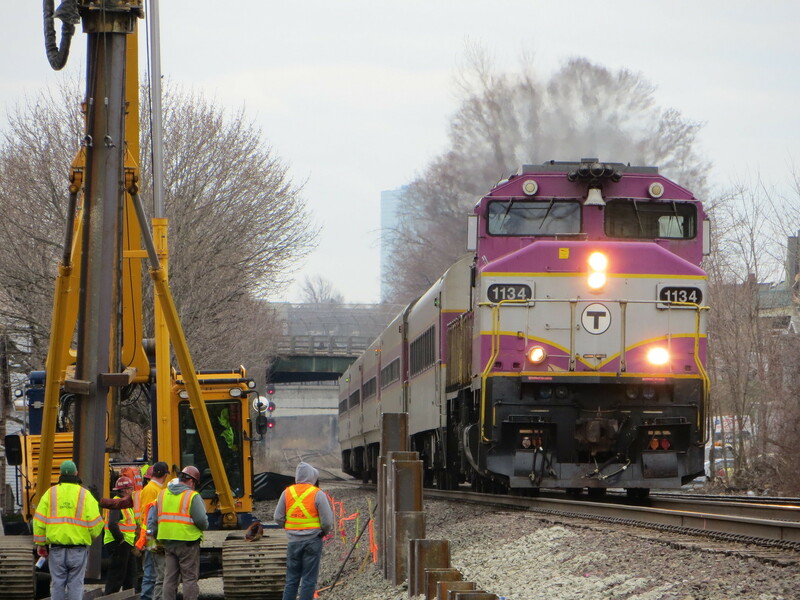 Davey was able to sporadically update riders with photos covering things like his visit to Korea earlier this year to tour construction of the first cars in the MBTA's new order of bi-level commuter rail cars. This wasn't nearly enough to assure the public of the work that it does and was far less than what the MTA in neighbouring New York City has been doing with Flickr to cover weekend work. It's good to see the MBTA has ramped up their own behind-the-scenes coverage of work, instead of having to be at the mercy of the press to cover their overnight and weekend work. This is photographic evidence to reassure the riders and general public that work is being done to the system, especially work that is invisible, but important, to riders. Now it's up to the press, blogosphere, and twitterverse to get the word out.